As a concept, is history being re-written through the cinema? Or alternatively, is the cinema preserving the ideology of a story written within a visual tale? Intriguing question, right? And one that will not be answered in this classic Kung-Fu film Directed by Tsui Hark; and Starring: Jet Li, Yuen Biao, Jacky Cheung, Rosamund Kwan, and Shi-Kwan Yen. It was made in 1991, and lasts for 134 minutes. Once upon a time in frugal China, there lived a martial arts doctor who went by the name of Wong Fei-hung (Jet Li). Now I am afraid to say that whenever Wong wanted to solve one problem, another problem would spring up straight away. For example, when a distant relative asks him to look after his 13th Aunt (Rosamund Kwan), inadvertently, she starts to fall in love with him. Or when he tries to resolve a territorial dispute with foreign dignitaries, amidst his discussion, members of his own militia are caught fighting with a rival gang, and arrested accordingly. Moreover, went Wong tries to talk to this rival gang and bring them to justice, his clinic was burnt down in an act of retaliation. Pretty bad turn of events, I am sure that you'll agree. But to make matters even worse for Wong, is that this same rival gang ally themselves with a dubious' American contingent, whom go about perverting the Chinese people, as well as trying to get their own back on Wong as well. Now what the chop-sticks can Wong do about this, huh? Play along and hope for the best? No - that's not his style. Though maybe it is for mischievous acrobat, Leung Foon (Yuen Biao). You see, during Wong's troubles, Foon has been darting in and out of them like a jack in a box on heat. Just trying his damndest to get a better footing within frugal China. However, it isn't until he meets the down on his luck martial artist, Iron Robe Yim (Shi-Kwan Yen), that he comes up with an answer. Granted, not the best answer in the world. Because instead of Foon and Iron Robe going to Wong and trying to aide his situation, they'd rather attempt to abase Wong's good name, and ally themselves with his enemies. Well, I suppose that is why what next transpires is a learning experience for one and all. As good and bad do fight - transgressions happen throughout the night - gun-powder does not hold might - and one Wong does make a right. Now before I give you my opinion on 'Once Upon a Time in China', please allow me to boar you senseless with some trivia first. Ready? Good. Let's go. (1) Jet Li badly damaged his knee during production, and he was doubled by Hung Yan-yan for some of the action scenes. However, for some of the other action scenes, he did himself with his leg in plaster. (2) The actor who played Bucktooth So, Jacky Cheung, was in fact a Jackie Chan imitator in the eighties. With such films as 'Fist of Death' [click here for review] under his belt. (3) The character of 'Porky' was in fact a real person who went by the name of 'The Butcher'. Also, he was the person who told the life and times of Wong Fei-hung to his Grandson, Run-Run Shaw, who was a Hong Kong movie producer, whom then went on to make these parables into the famous hung gar movies of the forties on-wards. (4) According media related sources, this movie started out as a proposed new film to star Jackie Chan, Sammo Hung, and Yuen Biao. Jackie would have played Wong [which he'd previously played in 'Drunken Master'], Sammo would have played Porky [which he did in 'The Magnificent Butcher'] and Yuen would have played Lueng Foon [which he did in 'Lin Shi Rong'). But alas, this idea did not really pan out in this manner, and only Yuen Biao made it into the finished film. (5) Most of the fighting techniques Jet uses in this film aren't the same as hang gar, because it's a combination of the long fist method and tai chi. (6) Yuen Biao was not happy with the end result of this film, because he thought that he would have had more screen time all in all. You see, in the original hung gar movies of the forties, Foon [Yun's character] was the 'mischievous imp' whom acted as the focus for the majority of the film, until Wong Fei-hung stepped in at the end of it to save the day. (7) When this film was originally released, Jet got a lot of flack because people thought he was too young to play Wong Fei-hung. 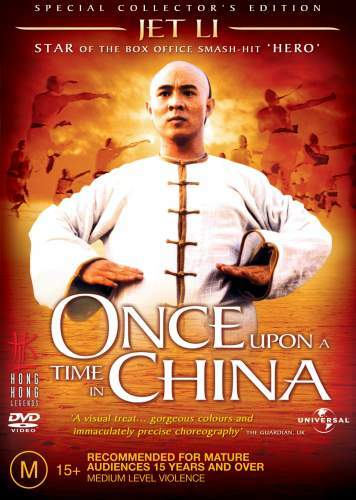 (8) This film was called 'Wong Fei-hung' in the East, and 'Once Upon a Time in China' in the West. Well, not only because no one really knew who Wong was in the West, but this title is very similar of the Sergio Leone film classic 'Once Upon A Time in America'. And (9) Shi-Kwan Yen starred in this films sequel 'Once Upon A Time In China 2' [click here for review]. Ooops! Was that a little too much information? Yeah. Sorry about that. Sometimes I get carried away and let rip like a martial artist's who likes to paint a lot. Which funny enough, is what you can say about 'Once Upon A Time in China' too. Well, I have to admit, when I first sat down and watched this film many a year ago, I was immediately blown away by how beautiful it looked. The sets were polished. The lighting was atmospheric. The actors were stoic and full of character. Plus the story was compelling to boot. And, for me, all of these factors really did show Hong Kong cinema at its best. My own personal favourite thing about this piece, apart from the high wire action, was the social commentary on how China was used an abused by foreign powers back in the day, and how its people had to adapt with the times or else they would have been left by the wayside. Also, I did like how both the actors and the action had an almost incremental way of getting onto the screen, as if you had to ascertain the essence of the movie before it started to play out. Honestly, I cannot praise this movie enough. The only thing that I can find wrong with it, is that sometimes the dubbing comes across as being a bit echo-ei within certain scenes, and that the acting does appear overtly mannered with one or two of the supporting cast. But apart from that, nish! It's a great film. Here, to close off my factual review, have a listen to the title song as performed by some funny looking chap called Jackie Chan.